President Donald Trump campaigned against globalism and free trade deals he said penalized the United States, and took office pledging to "put America first." But on Thursday morning, after arriving in Davos for the World Economic Forum, he became the first sitting president to attend the annual gathering of the global economic elite in nearly 20 years. So what could Trump — who has repeatedly railed against NATO, who pulled out of the Paris climate pact and vowed to renegotiate global trade deals — stand to gain from spending time in the Swiss Alps with billionaire businessmen and the international elite? Trump’s administration has maintained that his goals in Davos are consistent with his policies, and that attending the event simply gives him the opportunity to broadcast his policy views on a prominent world stage and to encourage leaders in governments and companies abroad to invest in the United States. 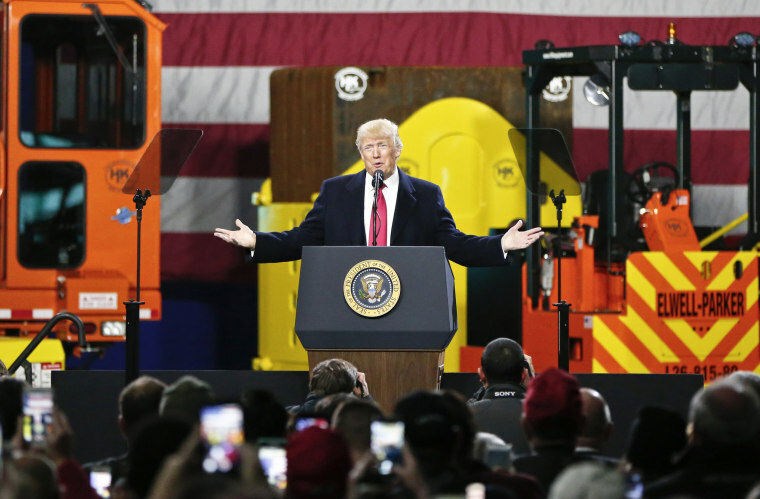 While Trump’s brand of isolationist-leaning economic populism — on display earlier this week as his administration imposed tariffs on solar panels and washing machines — may seem alien from what has typically been discussed at the yearly crème-de-la-crème convention, the White House has said it believes there is a way to finesse the contrast, and actually achieve its goals. Going to Davos — a trip no sitting American president has made since Bill Clinton went in 2000 — isn’t likely to offend Trump voters or be seen as as contradiction of their values, said Bonjean. “Even though the Trump base enjoys ‘America First,’ they still want to see him on a world stage. By doing this, Trump not only accomplishes that, but also will benefit from having the commanding presence he’ll achieve just by appearing with world leaders,” Bonjean said. Of course, it’s not as if Trump is just going to suddenly start spouting globalist views. Instead, his aides have repeatedly said, he’ll remain firm in his position that trade deals have disadvantaged the United States — and that the terms of those pacts must change. Trump, Cohn told reporters Tuesday, will “make it clear that there cannot be free and open trade if countries are not held accountable to the rules.” He’ll also be touting investment opportunities — a throwback to his time as a real estate mogul. Trump is also likely to use the conference to discuss critical diplomatic matters face-to-face with many of his counterparts, potentially allowing him to leave the forum touting national security gains. After arriving in Davos Thursday morning, he met with several world leaders, including U.K. Prime Minister Theresa May and Israeli Prime Minister Benjamin Netanyahu. In a brief appearance with May in front of reporters — their first since he cancelled a trip to London to open the new U.S. Embassy, blaming the Obama administration for selling the old building in the city for "peanuts" — Trump struck a conciliatory tone and even said the two leaders like "each other a lot." "We’re on the same wavelength in, I think, every respect," he said. "The prime minister and myself have had a really great relationship, although some people don’t necessarily believe that, but I can tell you, it’s true." According to the White House, the pair were set to privately discuss the Syrian conflict, the Iran deal and the North Korean crisis. With Netanyahu, Trump again touted his decision to recognize Jerusalem as the capital of Israel and to move the U.S. embassy there. He also seemed to threaten withholding foreign aid to the Palestinians if they don’t enter negotiations with Israel on a peace deal. The two leaders will discuss Iran’s “destabilizing heaver” as well as “efforts to reduce Iran’s influence in the Middle East, and ways to achieve lasting peace,” the White House said earlier this week. Later Thursday, Trump is scheduled to hobnob with Klaus Schwab, the founder of the World Economic Forum, and with leaders of “select European companies,” where he will urge them to invest in the U.S., the White House said. On Friday, Trump will meet with Rwandan President and African Union Chairman Paul Kagame “to reaffirm the U.S.-Africa relationship,” McMaster told reporters. Just weeks ago, Trump referred to African nations as "shithole countries" during a meeting with a bipartisan group of senators. Trump will cap off his Davos visit with a speech in which he is expected to unapologetically discuss his “America First” policy agenda. "Expect this president to go there and show what 'America First' continues to look like on the world stage," White House counselor Kellyanne Conway told Fox Business Network this week. There is also at least one Davos distinction Trump is sure to relish.